Clayton Patterson (born October 9, 1948) is a Canadian-born artist, photographer, videographer and folk historian. Since moving to New York City in 1979, his work has focused almost exclusively on documenting the art, life and times of the Lower East Side in Manhattan. Before moving to New York City in 1979, Clayton Patterson studied art at Alberta College of Art, University of Calgary, University of Alberta (Edmonton) and the Nova Scotia College of Art and Design University. He taught printmaking at University of Alberta, etching at NSCAD, and high school art at Memorial Composite High School in Stony Plain, Alberta. He also worked for other artists as a freelance lithographer and print maker. The photographer Clayton Patterson is a living testament to the New York of yesteryear. Day after day, he captured that special time during the 80s and early 90s when the Lower East Side was both dangerous and the home of the city's creative class. His images document the more mundane, daily grind of living in the neighborhood, as well as the larger cultural clashes that occurred, like the Thompkins Square Riots in 1988. Patterson has lived in the neighborhood for more than 30 years. During that time he has amassed an archive of over half a million photos as well as hundreds of hours of video footage that preserve the area's history, the characters and establishments that made it special. 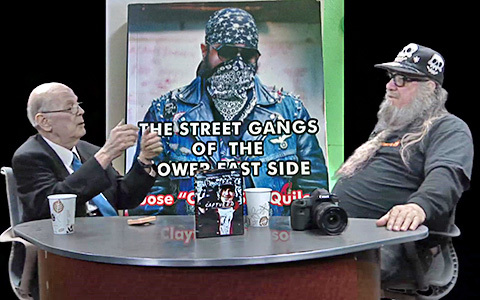 Be it street gangs, drag queens, or GG Allin, if it happened on the LES there's a good chance Patterson was there, doing whatever he had to do to get the shot. He has been arrested 13 times and battled countless lawsuits over the past 20 years, all related to his uncompromising documentation of lower Manhattan. ABOUT THE AUTHOR: Harold Hudson Channer is a talk-show host on public-access television cable TV network ►Manhattan Neighborhood Network, or MNN. He is the longest-running producer for the network, having done over 2,200 interviews over 40 years.